My ovaries pre-surgery. The small white ball on the left of both shots is my healthy ovary. 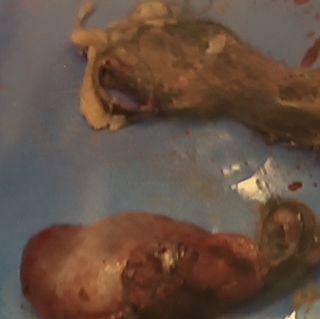 On the left-hand image, in the center, is my uterus. The large white ball on the right is the ovary housing the dermoid. My periods came in like a wrecking ball every month from the time I was 15—painful bouts of dry heaving, blacking out, and intense inflammation were typical on the first day of my cycle. Things got worse in my mid-twenties. Every 60 days or so, I would need to call out sick from work. One of the worst episodes went down while I was sleeping over at my then-boyfriend’s place. Early in the morning, my body felt extremely bloated—like a water balloon right before max capacity. The cramps were unbearable, weighing me down like an iron fist. I shifted from sleeping on my side to my back to the fetal position... hours of contorting in a search for relief. But it was worthless: I knew I was in for it. I made my way to the bathroom and ran a hot bath, which had helped in the past. Before I could step in, I started getting waves of hot flashes and my mouth felt like I'd just chugged a copper milkshake. My vision blurry, I knelt down in front of the toilet and started dry heaving and vomiting bile. Eventually, I passed out on the bathroom floor, my head hitting the cold, hard tile, and my body started shaking. When I came to, I crawled back in bed, called off work, and waited for the next round to hit me. A dermoid cyst is common, but super freaky—they can contain hair, teeth, bones, and fat cells. Seventeen years and five doctors later, I finally found a gynecologist who would listen to me. Dr. Megan Sheldon, D.O., was the first doctor to agree that the pain sounded extreme and referred me for an ultrasound. 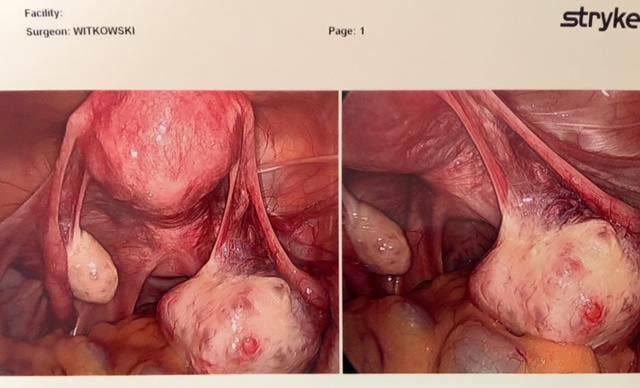 A week later, sitting with my manager at Starbucks killing time before a meeting, I got the call: My right ovary was housing a large dermoid cyst. A dermoid cyst is common, but super freaky—they're residual embryonic cells, a.k.a. they're present at birth, and can contain hair, teeth, bones, and fat cells. They often develop during the reproductive years and can cut off the ovary's oxygen supply, rendering it dead, and can even lead to cancer if left untreated. A dermoid is a form of the teratoma tumor, and the word "teratoma" comes from the Greek word for "monster." I needed to have my "little monster" removed within the next three to six months because "this is no clementine cutie you got in there," Dr. Sheldon told me. "This is a full-size Florida orange, and it's best to get it out as soon as possible." Over the next couple months, while I looked for a new doctor to operate on me (Dr. Sheldon was moving from Chicago to Denver at a very inconvenient time), I obsessed over medical threads and YouTube videos of dermoid surgeries. I convinced myself that I might die during surgery, so I took myself on a goodbye tour of sorts with friends, going to dinner and texting them how much I loved them. I convinced myself that if I survived, no one would love me without ovaries. So, I reconnected with exes. Then, I regretted reconnecting with exes. The little monster was overstaying its welcome. I still don't quite understand how a cyst the size of a Florida orange could grow inside me without me knowing. But looking back, I did always have lower back pain, and I was never able to sleep on my left side. I'm just lucky I found a doctor who listened. Many women have recently come forward with their stories of not being taken seriously by doctors and how that has had detrimental effects. Women are often told directly or indirectly that they don’t know their own bodies, or that the pain they are experiencing is probably more mental or emotional than physically valid. That they are melodramatic and prone to bouts of exaggerations. But the women I know understand their bodies quite well and more often than not downplay pain, so as not to seem weak. I think it's so important for women to find doctors that will listen to them and believe them. The medical community needs to shift its perspective when it comes to women and women's health. And we need to be clear, consistent, and strong when advocating for ourselves. It’s trying, exhausting, and frustrating to always have to fight for your well-being, but it’s important. Ask what you’re options are, otherwise the little monster inside of you is just going to keep growing and growing until it bursts.